is a commercial real estate practitioner-scholar based in Washington, D.C., working in real estate finance, development, and law. He has worked for ExxonMobil, Marriott, The American National Red Cross and several law firms. He is currently creating his own investment firm, focusing on international investment into the United States, particularly into the Washington, D.C., area. He founded and directed the graduate real estate program at Georgetown University, directed the graduate real estate program at Johns Hopkins University, and is currently teaching real estate at the University of Maryland. He is a graduate of The University of Chicago, Harvard and Cornell Law School. How do we firm up the vague definition of “Smart Cities,” and begin gathering the information specifically needed to implement this idea? In particular, how do we integrate multiple Information and Communications Technologies (ICT) and the Internet of Things (IoT) solutions in order to manage the assets of a city like Chicago? Chicago, the quintessential American city, is quickly becoming the nation’s leading city for data analytics. 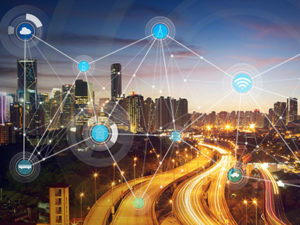 Through the “Array of Things” (AoT) (note the allusion to the “Internet of Things,” one of the components of Smart Cities), Chicago is applying data analytics to urban information collection to make itself the smartest Smart City anywhere. The Array of Things is a joint project of The University of Chicago and Argonne National Laboratory, in partnership with the City of Chicago. Chicago’s Array of Things is a system of advanced urban sensing devices which has been called an “urban telescope.” The AoT project is a network of modular sensor boxes or “nodes” that are being installed around Chicago to collect real-time data on the city’s environment, infrastructure and activity.3 Though centered in Chicago, other cities and countries are already participating in the Chicago-instigated AoT project. The Array of Things has been likened to a “Fitbit for Cities” which measures the health of a range of urban variables like climate, air quality and noise. The Array of Things falls squarely within the University of Chicago’s longstanding traditions of urban sociology, intensively studying the city of Chicago, quantitative social science, and rigorous focus on the natural sciences, as well as within Argonne National Laboratory’s tradition of applied science for the public good. More broadly, the Array of Things robustly integrates several key strains of current thought and practice in real estate and business: environmentalism (with quantitative standards like the U.S. Green Building Council’s LEED); energy conservation (with quantitative standards like EPA’s Energy Star); health-promoting real estate (with quantitative standards like the Delos Well Building Standard); real estate tech; civic tech; and big data. The National Science Foundation awarded the University of Chicago a $3.1 million grant for the AoT project. The Chicago Innovation Exchange and Argonne National Laboratory also each invested $150,000 to fund the pilot project. Argonne National Laboratory also expended over $1 million on internal research to develop the platform technology underlying the AoT. The City of Chicago is funding the installation of the nodes and will provide electricity to them via the traffic signal poles to which the nodes are being attached. Data scientist Charlie Catlett and researchers from the Urban Center for Computation and Data of the Computation Institute, a joint initiative of Argonne National Laboratory and the University of Chicago, lead the AoT project. Peter Beckman and Rajesh Sankaran of Argonne National Laboratory developed the underlying software and hardware design, known as Waggle, for the nodes. Product Development Technologies developed the custom enclosure design for the nodes, based on early designs by Douglas Pancoast and Satya Mark Basu of the School of the Art Institute of Chicago. As noted above, the project is executed in partnership with the City of Chicago. The AoT will operate as a large-scale infrastructure for capturing data from a wide swath of the City of Chicago, and providing related services for Smart City research, development, education, prototyping and demonstration of both open and proprietary techniques and services. AoT enables the collection of (1) real-time, instant, location-based data about the city’s environment, infrastructure and activity, and (2) time series data over a long period so as to reveal patterns that indicate important long-term trends. The AoT program thus potentially enables policymakers, real estate developers, researchers, and residents to collaborate on specific actions that will make Chicago, and by extension other cities, a healthier, more efficient, and more livable place. The data will make Chicago a truly Smart City, enabling the city to reduce costs by anticipating and proactively addressing potential problems like urban flooding. The data AoT collects is open, free and available to the public. The nodes will transmit data to a secure central database server at Argonne National Laboratory. Data will then be published openly to allow organizations, engineers, scientists, researchers and individuals to study urban environments, develop new analysis tools and applications, and inform urban planners. Raw data will also be posted to the City of Chicago’s open data network and Plenario, a web-based portal that supports open data search, exploration and downloads with open datasets from Chicago and around the world. AoT and the data it collects are generally intended to promote three types of research: (1) the collection and open publication of sensor data about public urban spaces, (2) research in areas such as sensing and infrastructure technologies, and (3) research in software and services. The City of Chicago will mount a total of 500 nodes on streetlight traffic signal poles around the city by the end of 2018. The city began to install the nodes in summer 2016. The AoT team is collaborating with several City of Chicago partners, including the Department of Information and Technology and Department of Transportation, as well as researchers, neighborhood groups and community members, to determine the best location of nodes for the development of AoT. Nodes can provide data relevant to a local concern or issue of importance to the residents and businesses. A relevant scientific research question may be better investigated with data from the nodes. A planned or potential policy or instrument that could be optimized, measured, or informed based on use of data from the nodes, and/or from scientific analysis of that data. Each node contains five components, with subcomponents as described. A node power manager, with (a) a node health monitor, and (b) resilience factors. Light and infrared sensors: light sensor for light intensity, cameras for vehicles and pedestrian traffic (images processed within the note and then discarded), and infrared sensor for cloud cover and surface temperature (note that air temperature is measured by the environmental services sensor; see above). The node components connect securely to the AoT-dedicated Argonne National Laboratory server, then to Plenario, open data portals, dashboards, and apps. Continued research and development will help create sensors to monitor other factors of interest such as flooding and standing water, precipitation, wind and pollutants such as lead and particulate matter — Clean Air Act criteria air pollutants — which are not currently covered. Some nodes may have expanded capabilities, such as anemometers (to measure wind speed), precise air particle sensors (to measure pollutants like smoke or pollen) and sky-facing images to understand cloud cover and sunlight. AoT nodes vary in price, depending on their scientific capabilities, from $500 to $2000 per node. Because the AoT data will be published openly and without charge, it will also support the development of innovative applications, including mobile applications. Perhaps most importantly, the AoT team expects that many unanticipated, innovative applications will be created by outside parties using the AoT data, realizing the potential of an open, community-based initiative. The imaging camera in each node detects features such as standing water, weather conditions and sky color (an indicator of pollution), and/or to count the number of pedestrians and various types of vehicles on public streets. After initial calibration, no images or video will be stored within or transmitted from the nodes. All images are processed into numerical data within the node, after which image data are immediately deleted. The Technical Security and Planning Group chaired by Von Welch, director of Indiana University’s Center for Applied Cybersecurity Research, will review all hardware, software and data being collected by AoT. Operating as an external, independent review team, the Group will be consulted whenever there is a request for a new kind of data to be collected. The Array of Things Executive Oversight Council will be co-chaired by the Commissioner of the City of Chicago’s Department of Innovation and Technology, Brenna Berman, and by Urban Center for Computation and Data AoT Chair, Charlie Catlett, with additional members selected from academia, industry, nonprofits and the community. No data will be monitored without the approval of the privacy and security external oversight committee, the City of Chicago and the AoT executive committee. In addition, the operation of the Array of Things will be governed by privacy policies that will be published prior to installation of the nodes. By 2017, each of these cities will receive five to ten nodes for use in monitoring local environmental, infrastructure and activity data. Additional U.S. and international cities have expressed interest in partnering with AoT. The AoT project, one of the largest and most sophisticated programs of its kind, has overcome considerable inertia and marshaled remarkable energy. However, the project has limited resources and time, and is currently focused on the deployment of the nodes. It is developing a deep relationship with the real estate industry only gradually, so that the project has not yet set forth the full implications of AoT for the commercial real estate industry. AoT is making its information available to the general public, including real estate developers and investors. The information is available not just in the aggregate, but from each individual node, which is particularly helpful for specific real estate projects near nodes. AoT potentially renders the valuation, acquisition, and disposition of properties more precise. The information from the nodes about noise, vibration, light, environmental contaminants, vehicle traffic, pedestrian traffic and other factors that influence property and neighborhood value should make appraisals more accurate and reduce re-trading risk. AoT may represent the first glimmer of hope for an entitlements process that works better for both the public sector and the private sector. Cities like Chicago currently collect information in the form of permit applications, certificates of occupancy, inspection results and other relatively episodic means. While the city systematically collects information at the time it issues specific permits and approvals, it generally does not collect such information on a continuous basis. Moreover, cities and, indeed, multiple levels of government, usually collect information on an agency-by-agency basis. Although there are some good reasons for this, such as agency expertise, the need for real estate developers to work with many agencies is one of the main things that makes the entitlements phase such a time-consuming and expensive process. By contrast, the AoT node sensors collect information on an ongoing basis without regard to specific agency — truly a unified, if not fully comprehensive, source of ongoing collection for entitlements-related information. A potentially fruitful direction to make the AoT nodes more comprehensive is expressly to coordinate the array of sensors provided within them with the different zoning, planning, environmental, and similar laws that embody the entitlements process in Chicago and other cities, and to capture the exact information required by each law, thus facilitating compliance by developers, investors, and other real estate practitioners, while probably also reducing the workload of public employees. The information captured by a given node near a new project, and made openly available to the public, would give architects, urban designers and planners information as to temperature humidity, vibration, noise, light, criteria air pollutants, vehicular traffic, pedestrian traffic and similar variables, from which they could calibrate the design to each specific variable. Some of the information from the nodes, particularly as to humidity, vibration, noise and light, should assist contractors and subcontractors in the construction phase. Possibly some of the node camera sensors could be coordinated with private cameras to record the progress of the construction work. Much of what appears in the entitlements phase applies to the operation phase as well. Deriving information from the nodes on a continuing multimedia basis rather than an episodic agency-by-agency basis should enable both building managers and asset managers to calibrate their building stewardship more effectively, both increasing service level and reducing costs. The nodes may assist in monitoring the ongoing efficacy of environmentally-focused LEED standards, health-focused Well Building standards and similar standards, which have become an increasingly prominent issue. Particularly for forward-looking real estate thinker/doers who practice real estate counseling, the Array of Things holds great importance. As such, real estate counselors will no doubt come to play a considerable part in rolling out the AoT project, and related projects, across the nation and around the world. And given the strong interest of real estate counselors in real estate data, information and research, they will seize upon the open source nature of the AoT data, and will utilize that data to create advanced buildings, urban design and metropolitan form.